Now that we have covered surgical face lifts, I would like to share this information I found out about laser face lifts. As the name implies, laser face lifts is a face lift which uses laser technology to improve your skin condition and remove wrinkles. Laser is used to destroy the top skin layers that have been damaged in some way or the other, and thus encourages new skin cell growth. Laser also helps in tightening a person’s sagging skin to make you look younger. The benefit of laser face lifts over a traditional face lift is that there is no need of the doctor cutting into the skin and repositioning it. The doctor uses a laser that emits a powerful beam of light to heat and cause a burn to the person’s skin surface. The top skin layer is thus removed and the skin protein collagen tightened to give youthful looking skin. On completion of treatment, the skin that grows back in the treated region is smoother, tighter, less blemished and rid of wrinkles. 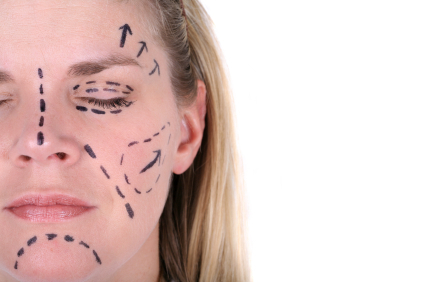 Basically, with a laser face lift, the patient’s skin is resurfaced and not lifted. People with shallow scars and fine wrinkles will see a marked improvement on the completion of one treatment. However those with deep wrinkles and scars will need additional treatments to remove blemishes. This is why most people prefer getting a laser face lift on areas that are prone to developing fine lines, like on the forehead and skin of eyelids. It is also more often used to remove wrinkles around the mouth and blemishes on the cheeks. This laser treatment can be used not only on the face, but also on hands and even neck. The anesthesia that the doctor uses during a laser face lift depends on the extent of treatment the patient chooses. Like if the laser is to be used in small areas of skin, local anesthesia and sedation will be sufficient. However if the procedure is more extensive, you may need general anesthesia. Laser face lifts are generally safe. However if any complications do occur (which is a rarity), it may include symptoms like infections, scarring, swelling and redness. So if you want to remove your wrinkles quickly, without much scarring or surgery, a laser face lift is the best choice for you.